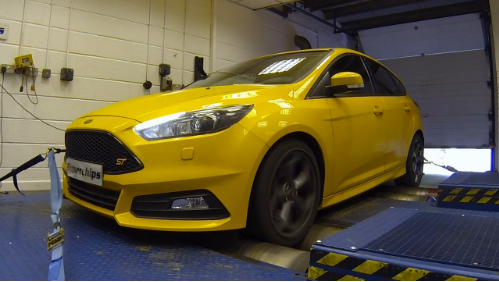 Global ECU remap expert Superchips has released a conversion for the latest version of the Ford Focus ST. The newest version, denoted the Mk3.5 and which is Euro6 compliant, uses the turbocharged, four-cylinder EcoBoost engine with Bosch MED17.2.2 management. Developing 250PS in its original form, the conversion for the ‘facelifted’ Focus ST releases an additional 47bhp at 2871rpm and a huge 124Nm torque at 2461rpm. The new power and torque curves show a huge hike in both from low revs, with massive gains from 2500rpm onwards. The result is a smoothed-out torque curve which gives rise to a more progressive, linear power curve for sustained acceleration and performance. The cost of the Bluefin device is £399 including VAT. 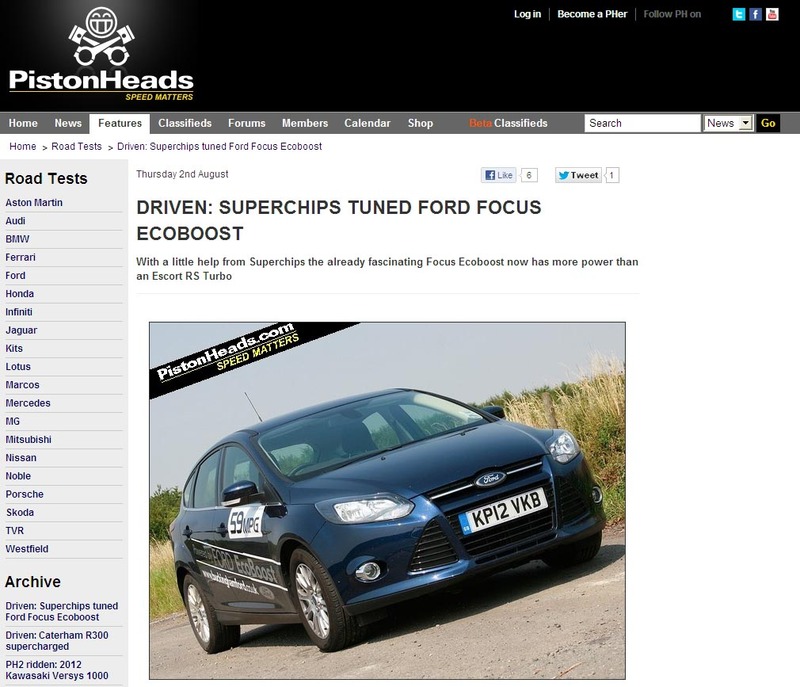 Superchips Ltd, the world leader in automotive electronic tuning, is delighted to announce arguably its most significant product launch of 2012 – a performance improving ECU remap for the diminutive 1.0-litre, 125 PS (123 bhp) turbocharged Ecoboost Ford Focus. The Superchips ECU remap is available on the firm’s market leading Bluefin ‘Plug-in and go’ DIY programming handset, enabling Focus 1.0-litre Ecoboost owners to enjoy an impressive, fully reversible performance upgrade at a highly affordable price. The new ‘downsized’ 1.0-litre Ecoboost engine has won plaudits for its economy, refinement and reasonable level of urge. 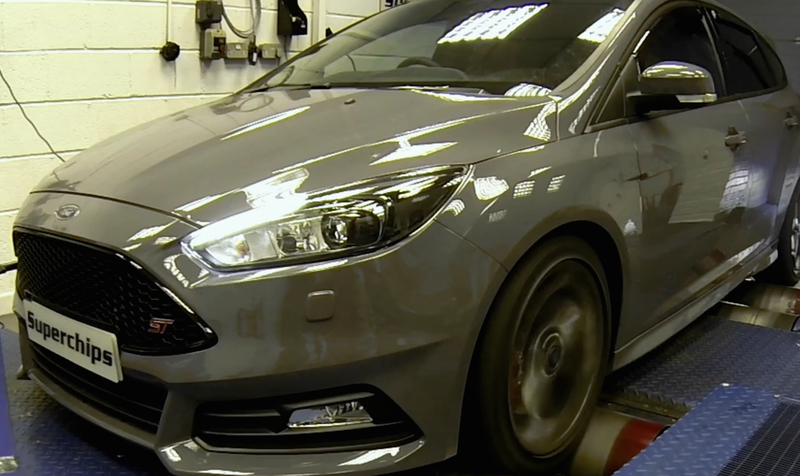 However, dressed in the Focus’ 1240 kg bodyshell, there’s no doubt these cars would benefit from the extra power, torque and responsiveness offered by a Superchips remap. 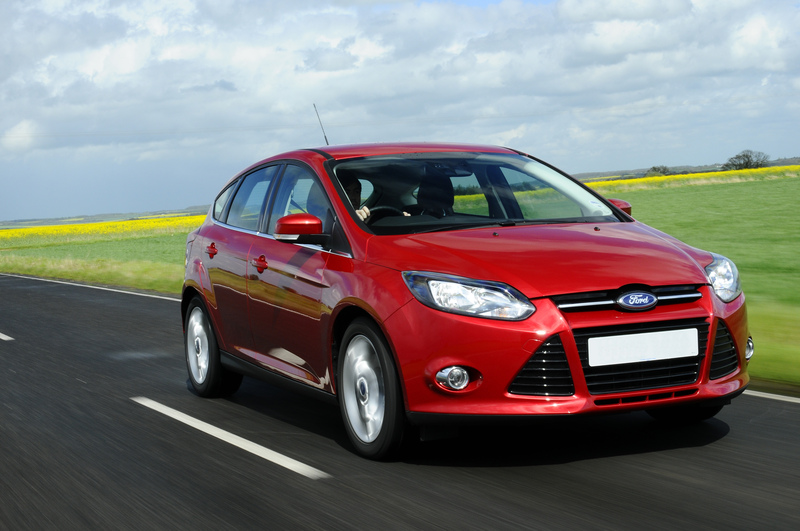 And now thanks to Superchips’ unique Bluefin ECU technology, this additional power can be enjoyed by 1.0-litre Ford Focus owners in a matter of minutes and at the touch of a button, all without even lifting the car’s bonnet – anytime, anywhere. Tuning Ford’s tiny, three-cylinder, direct injection turbocharged Ecoboost engine represented a unique challenge to Superchips’ technicians. But by using a well-proven combination of controlled conditions in-house chassis dyno testing, allied to real world road testing, the firm has been able to rewrite the ignition, fuelling and boost control parameters of the 1.0-litre Focus’ Bosch MED17 engine management system to deliver safe, reliable and consistent additional power. 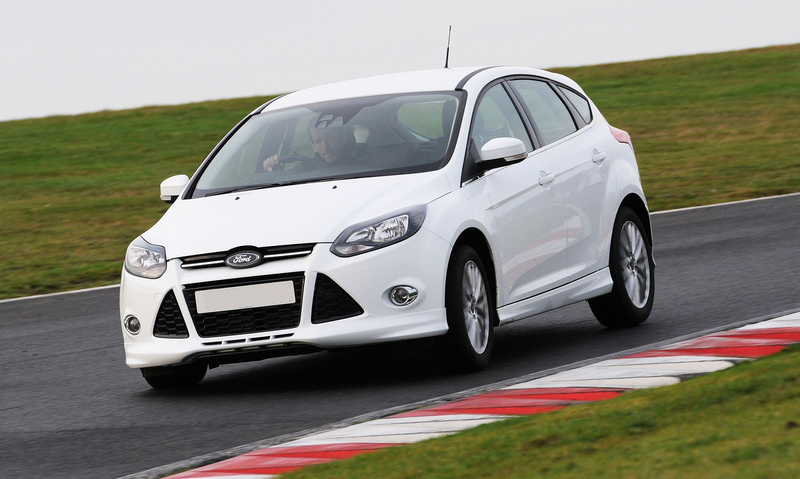 Dyno testing has proven that the Superchips ECU remap for the 1.0-litre Ford Ecoboost Focus produces excellent progressive performance increase, with a maximum power gain of 16 bhp at 4728 rpm. 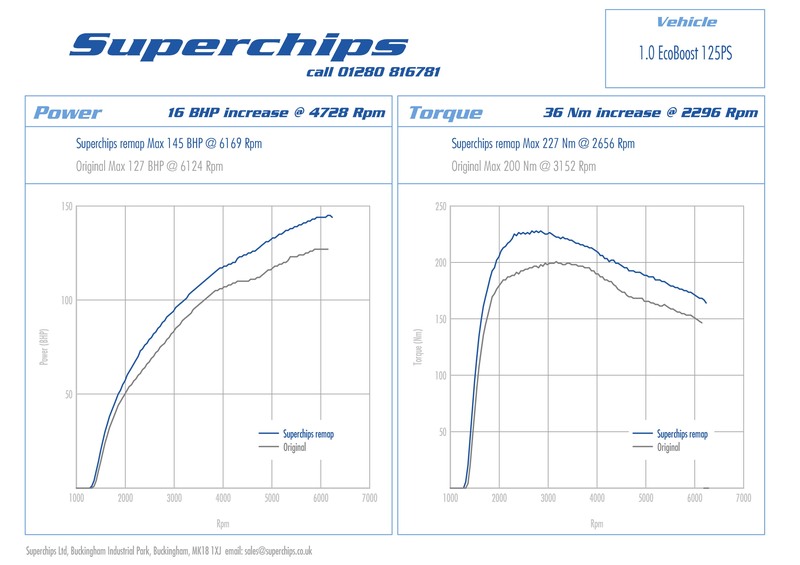 The Superchips Bluefin ECU remap for the 1.0-litre Ecoboost Ford Focus also boosts peak torque, in this case by 36 Nm at 2296 rpm, which when combined with the improved throttle response greatly enhances the overall driving experience. From behind the wheel this means that fewer gearchanges are needed to make swift progress, while fast driving, load carrying and overtaking all become easier. Happily the additional urge offered by the Bluefin doesn’t detract from the standard Focus 125 PS Ecoboost’s acclaimed 56 mpg average fuel consumption. So despite the performance increase produced by the Bluefin upgrade, if a Superchips remapped 1.0-litre Ecoboost Focus is driven in a ‘like for like’ manner, economy will not be adversely affected. 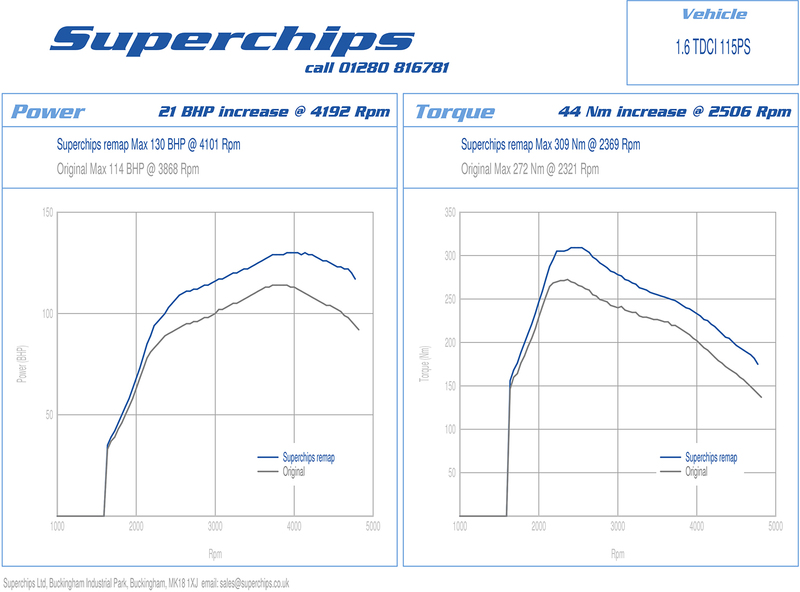 Installation of the Superchips’ Bluefin ECU remap couldn’t be easier on the 125 PS Ford Focus 1.0-litre Ecoboost. No technical skills are required, as Superchips’ customers simply plug the Bluefin handset into the Focus’ OBDII diagnostic port and then follow the on-screen instructions, a process which takes moments. As part of this process, the original factory Ford 1.0-litre Ecoboost ECU map settings are stored within the Bluefin handset for future use, which means reverting the car’s settings back to standard is an easy ‘Plug-in and go’ task. Alternatively, customers can visit one of approximately 80 Superchips performance centres, where trained technicians can undertake the procedure.